Any accident involving rented equipment can pose additional challenges in the context of a personal injury lawsuit. The reason for this is that the owner of the equipment, whether it is a car, truck, van, forklift, or anything else, is likely going to avoid accepting any liability as a result of the negligence committed by the person who rented the item. Rental companies typically try to get customers to sign waivers saying the rental company is not liable for any damage caused to others including personal injury property. However, as our Boston personal injury attorneys can explain, the injured plaintiff was not a party to the rental agreement and was therefore not in “privity of contract” with the rental agency, and this may be a way to disclaim the waiver as part of your personal injury case. Essentially, if a rental company has insurance covering the item they rent, as a matter of public policy, they may held responsible for any negligent act committed by the renter, because that is in the interest of justice. On the other hand, if we are dealing with a piece of large commercial equipment rented to a construction company such as tower crane, it is likely the construction company has a commercial general liability policy, so they would be able to pay out any judgment in personal injury lawsuit if the crane fell over and injured or killed someone. One interesting issue deals with the offer made for the renter to purchase an insurance policy from the rental agency. Whenever you rent a car, the agent always asks you if you want to purchase insurance for an additional sum. Many people are confused by this and may or may not agree to purchase the additional insurance. In the event an accident, the rental car company will try to claim they are not liable because they were not responsible for insuring the vehicle. However, they renting a registered vehicle, which already has insurance, and this may make if more difficult to disclaim. 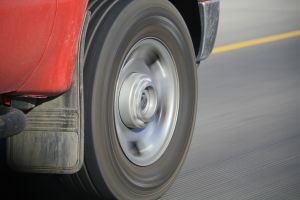 Many of the accidents involving rental vehicles involve moving trucks or vans, because these are large vehicles and are typically being driven by people who are not used to driving a truck. According to a recent article from WCVB Boston, a man in Wellesley was seriously injured when a moving truck rolled down a steep driveway and hit him. Authorities say the accident occurred around 9 a.m., when two of victim’s family members backed the rented truck into a hill with a significant slope and shut it off, but it started to roll before the driver could engage the emergency brake to the stop the vehicle. At the time it started to roll, the 60-year-old victim had approached the back of the truck to load it. When the man noticed the truck was moving, he tried to jump inside the cab so he could apply the brake and stop if from rolling down the hill. While he was trying to get inside, witnesses say he slipped underneath the truck and got run over. The truck kept rolling and went across the street and crashed into a mailbox. First responders said the man was in critical condition following the accident.